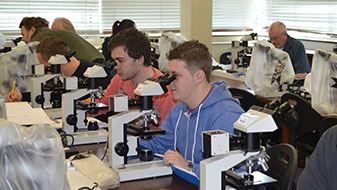 This course provides the attendee with the practical abilities to carry out sample preparation and mechanical testing as well as the theoretical knowledge to interpret results. Technical personnel, engineers, production managers, and quality control personnel whose roles will benefit from an understanding of practical metallurgy methodology and the relationship of test data to physical properties. To provide the attendee with the practical abilities to carry out sample preparation and testing as well as the theoretical knowledge to interpret results. The ability to prepare metallurgical samples, carry out mechanical testing, interpret test data, relate microstructure to mechanical properties, Produce a technical report to communicate findings. • Detailed consideration of two alloy phase diagrams, Cu - Ni and Fe -C.